Our vibrant votive candle holders are the ideal candle containers for your next celebration. These stunning decorative holders fit standard size votive candles, tealight candles, led candles, flameless candles and soy votive candles. The glass holders are carefully made with durable material, so after your party you can use as home décor. Each glass candle holder features fancy vintage diamond facets and beaded rim. Pairs well with many party ideas such as bohemian decor, rustic decor, rose gold decor, tea party decorations, beach wedding décor, Moroccan theme events, and more. Multifunctional use for home décor, baby shower, bridal shower, wedding reception, quince, birthday parties, candle aromatherapy, candle display and much more. A creative set of jewel tone bud vases that can hold air plants, succulents, or mini cactus. 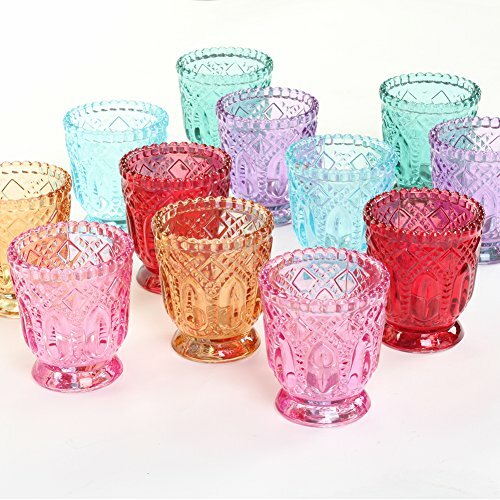 BULK 12 PACK of stunning color glass holders. Includes 6 vibrant jewel toned colors; pink, amber, royal purple, turquoise, emerald and ruby red. Mix and match from our collection of votive holders for a diverse candle display. FEATURES FANCY DIAMOND FACETS. Each glass candle holder reflects candle light beautifully. Not made of plastic. Re-usable and practical, great as party favors. STABLE BASE: Measures 2 inches wide and is secure to hold votive candles. The pedestal base adds flair of elegance. Use our pedestal candle holder not only for candles, but also as jewel tone bud vase floral arrangements. SIZE: 3 inch Height x 2.75 inch Diameter. The 2.5 inch depth works well with standard size votive candles, and small tea light candles. Makes a lovely bulk mini bud vase set. CENTERPIECE IDEAS: Jewel-toned wedding ideas, fall jewel tone wedding inspiration, Moroccan decor, Moroccan living room decor, beach home decor, backyard decor, Bali garden, outdoor decor, patio decor, bohemian decor, candle quince ideas, candle Zen garden ideas and more.